"Sudden Respect" is our NewsBusters topic category for situations in which the liberal media suddenly lavishes praise on a conservative because he is now criticizing fellow Republicans or conservatives. Maybe we need a new category: "Sudden Disrespect," to cover cases in which the MSM turns on a Democrat who dares to not march in liberal lockstep. Joy Reid provided a perfect example of the phenomenon on her MSNBC show today. Her guest was Bill Burton, who was a bosom buddy of the liberal media back when he was one of the earliest members of Barack Obama's 2008 presidential campaign, later becoming Obama's deputy press secretary. But now that Burton has had the audacity to become an adviser to Howard Schultz's potential presidential campaign, he came in for far from kid-glove treatment. Burton more than held his own. It made for some chippily entertaining TV. The Clinton cohorts are out to defend Hillary, and their maxim is that no Democratic scandal is really a scandal. Former Obama spokesman Bill Burton was on Fox News Channel’s The Kelly File Tuesday night, where he was pressed by Megyn Kelly on the “cloud of corruption that follows” Clinton everywhere she goes. Patriotism is the last refuge of a scoundrel, Samuel Johnson famously observed, much as truth is a last resort to liberals. On Tuesday's Crossfire (HT commenter Gary Hall), liberal Democratic guest Bill Burton tried to impress the show's hostesses and guest David Limbaugh when he said of President Obama: "More people have jobs than they did when he took office." Serious question: is there anything—anything!—Debbie Wasserman-Schultz won't say to promote Barack Obama? On Fox News Sunday, interviewed by guest host John Roberts, the Chairwoman of the Democratic National Committee somehow managed to keep a straight face as she brazenly claimed: "I have no idea of the political affiliation of folks who are associated" with Priorities USA, the Super PAC that ran the ad essentially blaming Mitt Romney for a woman's cancer death. But as is undoubtedly well known to Wasserman-Schultz, Priorities USA is run by Bill Burton—Obama's former Deputy Press Secretary. View the video after the jump. For the second straight day, CNN blew the whistle on a nasty and misleading Obama super PAC ad that ABC, CBS, and NBC entirely ignored as of Wednesday night. CNN hammered the ad, which links Mitt Romney to a woman's death from cancer, each hour from 6 p.m. through 10 p.m. and twice grilled the man responsible for the ad, Bill Burton of Priorities USA. "I think it is deliberately mendacious," stated CNN's Piers Morgan on Wednesday. "It is a deliberate attempt to lie and smear about Mitt Romney. And I find it contemptible. I mean I'm really appalled." The three networks showed no such disdain for the ad which will air in battleground states, because they failed to even mention it on Tuesday and Wednesday. Newsweek's Andrew Sullivan published another gooey, sycophantic article about Barack Obama Sunday this one claiming the object of his affection intentionally inflamed today's contraception controversy to trap his opponents on the right. Alex Wagner made an eye-popping remark on her MSNBC program on Wednesday, as she hinted that she agreed with former Obama spokesman Bill Burton's assertion that Ronald Reagan would feel out of place in today's GOP. When Burton claimed that "Reagan wouldn't have a chance in this Republican primary right now," Wagner stunningly replied, "I think he'd be a Democrat probably" [audio available here; video below the jump]. The anchor, a former employee of the left-leaning Center for American Progress, also touted a quote from Thomas Mann of The Brookings Institution and Norman Ornstein of AEI, who claim in an upcoming book that the Republican Party has become "an insurgent outlier- ideologically extreme...scornful of compromise...and dismissive of the legitimacy of its political opposition." Rick Sanchez: Fox News, MSNBC Biased, But I'm Not? CNN's Rick Sanchez positioned himself above the fray between "right wing" Fox News and "liberal" MSNBC on Thursday's Rick's List. Sanchez named Keith Olbermann, Rachel Maddow, and their network to his "List U Don't Want 2 Be On," after the Obama administration supposedly exposed his competitor's left wing bias, and claimed that he "wasn't necessarily liked" by the current or previous administrations. Before putting his colleagues at MSNBC on his "list," the CNN anchor invoked his longtime vendetta against his other competitor and took a swipe at the last vice president: "Much was made of Vice President Cheney's insistence- remember this?- on only watching Fox News in his travels. It's a true story. Whenever he checked into hotels, he would have his staffers tune all of the TVs in the hotel to only Fox News, so he could just hear about his policies, repeated back to him by a right-wing television network." Sanchez then moved on to his main subject: "Well, today I asked this question: what about MSNBC and their relationship now with this White House? 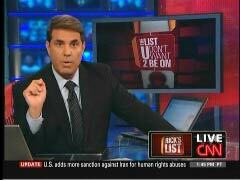 Here's 'The List U Don't Want 2 Be On.'" He continued with the claim that "if you don't think for one minute that MSNBC is to Barack Obama what Fox was to Bush and Cheney, then you obviously haven't heard this comment that I'm about to share with you- this comment from Deputy White House [Press] Secretary Bill Burton." Former South Dakota Senator Tom Daschle (picture at right is part of a Getty Images pic at a related New York Times story) has just upped the ante in Washington's tax-avoiding/evading game of "Can you top this?" 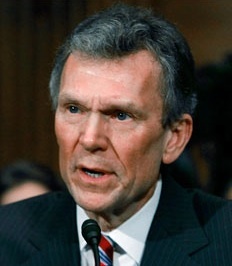 Whereas recently confirmed Treasury Secretary Timothy Geithner "only" $40,000 in back taxes and interest, principally relating to unpaid Social Security and Medicare taxes (with a dash of retirement-plan penalty and illegally deducted overnight summer camp expenses included in the mix), the man who Rush Limbaugh used to call "Puff" Daschle during his Senate days has upped to ante to six figures. In response to the Sunday evening revelations concerning the socialist, wealth redistribution views expressed by Barack Obama in 2001, the Obama campaign issued a statement blaming "the all too common alliance of Fox News, the Drudge Report and John McCain." This didn't sit very well with Fox News's Megyn Kelly who on Monday invited Obama's national press secretary Bill Burton on "America's Election Headquarters" to defend these allegations (h/t Johnny Dollar). Brian Williams, in the subsequent segment, chided Matthews on his emotionalism. The Hardball host was infuriated by Palin's description, in answer to a question from a third-grader, of the role of the vice-president. He also harped on the RNC's spending on Palin's wardrobe.